Personality: Roxas, unlike other Nobodies, seems to possess real emotions, due to his possible possession of Ventus's heart that may have stayed with him once he and Sora were separated. Many ranges of feelings come from him depending on his situation. Being Sora's other half, his personality is similar to that of his counterpart, with some differences. For example, when Riku confirms that Roxas is Sora's Nobody after they meet in Dark City, Roxas's statement ("What are you talking about? I am me! Nobody else!") is nearly identical to Sora's later reactions when the Organization XIII members address him as Roxas. 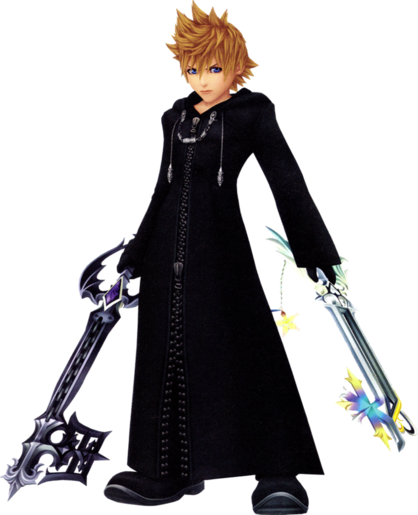 For example, Roxas is less impulsive than Sora, but far more quick to anger; he is short-tempered, aggressive, and stands his ground, characteristics that had mixed in his fighting style. He can be arrogant, confident, and cocky as proven in his battles, more so when he engages Riku in a fight, proclaiming that he could not beat him no matter how many times he attempted to. When blinded with anger, he lets go of all reason and focuses on venting his anger, as seen when he continually hacks at DiZ's computers and viciously attacks DiZ's hologram. His words have bite, and he isn't afraid to speak his mind. He even expressed some dislike for being compared to Sora early on due to their relation, which DiZ notes with amusement in their encounter. This type of main contrast between the boys is even portrayed in official art, with Roxas almost always having a dark, sort of fierce expression, while Sora's is a bit more loose and mellow. With a devil-may-care attitude in terms of recklessness, he can be rightfully selfish in certain intervals, but not selfish enough to not, in the end, return back to Sora willingly in understanding. Throughout the game, Roxas is presented as the type to not just let things happen, to twiddle his thumbs and wait when there's something about himself he doesn't comprehend. He constantly rebels against what he's told is his "place" and is a strongly independent individual. On the other hand, Roxas tends to be ironically melancholy and stoic, solemn and distracted, especially as he comes to realize the truth about himself, and in other points when he's confused and lost. Like Sora, Roxas has little patience for people who seem to be bending his will or trying to confuse him. He doesn't have an extreme lust for life as well, not taking everything in with a bright outlook, but he does wish and desire one of his own with fervor. And despite their differences, the traits he and Sora share are shown in how they deeply care for their friends, along with some instances where Roxas is happy, cheerful, kind, at ease, and carefree in good company—even shown laughing. Roxas was born in Twilight Town and soon discovered by Xemnas, who gave him his name. Having nowhere else to go, Roxas joins the Organization in hopes of finding the answers he needs. On Roxas's fifth day, Xemnas places Roxas under Axel's watch, and the two soon become best friends. When he visits Twilight Town, sometimes he catches sight of three regular kids: Hayner, Pence, and Olette, and wishes to befriend them. When Axel is sent to Castle Oblivion to interfere in Marluxia's plans to enslave Sora and overthrow Xemnas, Roxas is placed in charge of Xion, the newest member of the Organization and a girl about the same (physical) age as him. Though emotionally distant at first, Xion soon opens up to Roxas, revealing to him that she can wield a Keyblade, and the two become close friends after Roxas falls into a coma for several weeks, linked to Sora being placed in suspended animation by Naminé. After awakening, Roxas attempts to spend time with Axel and Xion, but he begins to react to the process of Sora's memory restoration, and begins to question why he wields the Keyblade and doubt the Organization's motives. At the time when he is at the Organization he begins a lot of missions involving visiting other worlds which cause Roxas to experience some of Sora's memories. As he spends more time with The Organization, Roxas grows increasingly impatient towards his unanswered questions. Meanwhile, he still works actively to help the Organization in their plan for Kingdom Hearts, using the Keyblade to release the Heartless' hearts. However, Xion, seeking answers to her own questions, departs the Organization to find herself. Roxas soon follows her example and defects from the Organization himself. On his way, he is intercepted by Axel, who attempts to persuade him to stay, warning him that the Organization would destroy him due to his betrayal. However, Roxas remains indifferent, saying "No one would miss me", and continues on his way.